The New Frontier is an Eisner, Harvey, and Shuster Award-winning six-issue comic book limited series written and drawn by Darwyn Cooke, published by DC Comics in 2003-2004. It was then collected into two trade paperback volumes from 2004–2005 and then an Absolute Edition in 2006. The story was adapted as an animated movie titled Justice League: The New Frontier, and released on February 26, 2008. Darwyn Cooke’s outstanding series details the beginnings of the Justice League set to a Silver Age background. Taking up both Writing and Artwork duties, Cooke re-creates the early time of superheroes not really seen since the 1950’s-60’s. The story bridges the gap between the end of the Golden Age to the beginning of the Silver Age in the DC Universe. At the end of World War II, The Losers are sent on a perilous mission to recover The Suicide Squad. 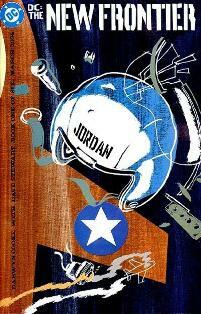 Plus, a brave young test pilot named Hal Jordan proves his mettle in the Korean War. They were heroes even before they put on costumes. 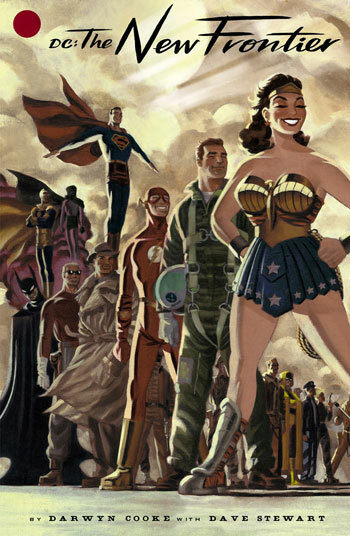 From World war II to 1960 this chronicles the evolution of superheroes in the DC Universe. The attitudes change of society and the Justice Society of America dissolves to give way to the Justice League of America and the new age of heroes has it’s beginning as a universal threat that only they can handle called the Centre requires their heroic help to save the world that needs them. The continuity of the story arc is explained by Darwyn Cooke himself, I’m following the exact continuity of the original books in the original time they occurred.” For example, the Martian Manhunter lands on Earth in 1953, the same year in which the Golden Age Manhunter from Mars, Roh Kar, was created, who served as the character’s prototype until J’onn J’onzz’s actual first appearance in Detective Comics #255 as Detective John Jones in 1955. Barry Allen becomes The Flash in 1956, the same year as his first appearance in the comics, and Hal Jordan acquires the power ring and becomes Green Lantern in 1959, again just like the story. 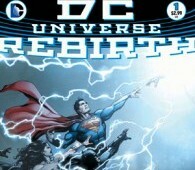 The story bridges the gap between the end of the Golden Age to the beginning of the Silver Age in the DC Universe. Darwyn Cooke art and story tell the history of comics and as he sees the superhero world of that time period. It is truly a classic and deserving as one of the Greatest Comics of the 21st century. 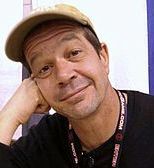 Darwyn Cooke is an award-winning comic book writer, artist, cartoonist and animator, best known for his work on the comic books Catwoman, DC: The New Frontier, The Spirit and Richard Stark’s Parker: The Hunter. In 1985, Cooke published his first comic book work as a professional artist in a short story in New Talent Showcase #19, but economic pressure made him leave the comic book industry, and he worked in Canada as a magazine art director, graphic and product designer for the next 15 years. In the early 1990s Cooke decided to return to comics, but found little interest for his work at the major publishers. Eventually, he was hired by Warner Bros. Animation after replying to an ad placed by animator Bruce Timm. He went on to work as a storyboard artist for Batman: The Animated Series and Superman: The Animated Series, and in 1999 he animated the main title design for Batman Beyond. He then worked as a director for Sony Animation’s Men in Black: The Series for a year. DC Comics then approached Cooke about a project which he had submitted to the publisher years earlier which eventually became Batman: Ego, a graphic novel published in 2000. The critical success of that project led to Cooke taking on more freelance work, such as X-Force, Wolverine, and Spider-Man’s Tangled Web for Marvel Comics and Just Imagine… Stan Lee for DC. Finally, he was asked to do DC: The New Frontier (2004), a six-issue miniseries which sought to tell an epic storyline bridging the gap between the end of the golden and the start of the silver age of comic books in the DC Universe. The rest is history Cooke has become one of the best in the comic book world. On May 13, 2016, Cooke’s wife announced on his official blog that he was battling an “aggressive” form of lung cancer, stating, “It is with tremendous sadness that we announce Darwyn is now receiving palliative care following a bout with aggressive cancer. His brother Dennis and I, along with our families appreciate the outpouring of support we have received. We ask for privacy as we go through this very difficult time.” Cooke died the next morning on May 14, 2016. He is grieved and missed by many including those of us at Comics Talk.